Florida has long been known for its sunny weather and white sandy beaches. 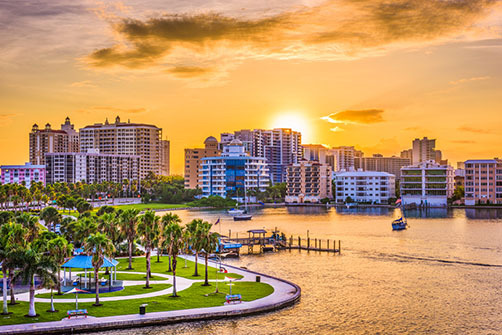 Sarasota, a prominent vacation destination, is nestled between the Southern end of Tampa and Fort Meyers with beautiful views of the Biscayne Bay. Sarasota has many wonderful attractions and sites to see from fresh Gulf Coast cuisine, to almost 40 miles of white sandy shoreline and was once known as the Circus Capital of the World. While there are numerous hotels in Sarasota, it’s hard to enjoy the city as the locals do while living in a cramped efficiency type room that many hotels provide. A better option to experience what Sarasota has to offer would be a luxury vacation rental, but these rentals are perfect for when you are looking to stay for more than a weekend and need a furnished home for a family or corporate retreat. If you fall in love with the city and are looking to extend your stay to a permanent one, there are also annual rentals available. Sarasota and the surrounding areas are full of weekend destination trips. Many attractions provide both a great family time and educational experience. Come enjoy all Sarasota has to offer. If you have never been to a real distillery or if you love a great glass of rum, this is the place for you. Siesta Key Rum offers free tours of the distillery throughout the day, each tour takes about an hour to complete depending on the number of guests and questions asked. The first 20 minutes guests will learn about the history of the company, including various awards for distilling practices. After that you are given a tour where the on-site distiller will explain the process from mashing, to fermentation to distilling and finally how wooden barrels are used for aging. The packaging room is your last stop before a free sampling in the tasting room. A guided tour is your best option if this is your first visit. Your guided tour experience is led by a trained and qualified guide that allows you to explore diverse areas of the garden, which are often not available to the general public. Explore the outdoor world of Florida’s flowers, plants and trees as never before. Make sure to book your tour in advance for the best experience, otherwise a guide may not be available. Today the Ringling is an amazing museum showcasing various art collections, but its history began almost 100 years ago as a winter home for John Ringling (one of the brothers and founders of the Ringling Brothers Circus). What started out as 20 acres grew to be almost 25% of Sarasotas total area. The house once completed, was five stories in height, 36,000 square feet, 41 rooms and 15 bathrooms at a cost of 1.5 million dollars. Siesta Key is made up of 3 of the most beautiful beaches you will ever see which stretch an amazing 8 miles and are known as “The World’s finest, whitest sand) alone the Gulf of Mexico. Each beach on Siesta Key has its own merits and experiences, but they all share the beautiful blue waters of the gulf, book cover worthy sunsets and a refreshing breeze to help ease the sunny weather. Siesta Beach was named as the #1 beach in the US in 2011, and the Travel Channel named it the Best Sand Beach in America in 2004. Crescent Beach is located just south of Siesta Beach, Crescent Beach is a much more private beach offering only one public road for beach access, this means that you will enjoy a much quieter relaxed beach without all the hustle and bustle. At the Southern tip snorkelers will find the Point of Rocks, this is an area that boasts of coral formations and colorful fish, so bring your camera. Turtle Beach is located on the southern tip of Siesta Key and offers a more active environment and a younger crowd. Public picnic areas, volleyball courts, playgrounds and more are available on a first come first server basis. If you bring your boat, you can use the boar ramp to launch and enjoy the waters. Fishing is permitted only in an adjacent lagoon. Children are sure to love Turtle Beach, not just for the name but for the incredible amount and variety of sea shells and sharks’ teeth that often wash ashore. Year after year, millions of new visitors enjoy the beauty of Sarasota which keeps the agents at Jennette Properties on their toes servicing the luxury vacation rental market with some of Sarasota’s finest homes. Properties are available year round, furnished and unfurnished so come down for a visit. When you decide to extend your stay to a more permanent one, our agents also offer annual rentals and professional advice on the area and local markets. At Jennette Properties we believe in leasing distinctive properties to extraordinary people, like you!